A cursed dress is being passed on from customer to customer, with fatal consequences. 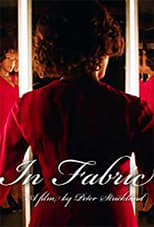 In Fabric is directed by Peter Strickland and was released on TBA. Director Peter Strickland's Horror & Comedy movie In Fabric is produced by BBC Films & Rook Films & was released 2019-03-29.